« HFL Poll: CRZ Verdict – Love or Hate? Listen to Episode 66 of the Horde for Life podcast for more audio discussion on the following topic. Generally speaking, I feel confident in saying that Blizzard has done an admirable job of admitting, learning from and not repeating previous mistakes. However one area where the fine folks in Irvine have failed in this regard is the repeated use of multiple and varied forms of in game currency. Recently it was announced that Blizzard will be adding yet another “currency” to The World of Warcraft as part of the 5.2 patch. Following up on the expansion released series of Elder Charms, The Thunder Isle patch will now add Mogu Charms of Fate. For those not in the know, after patch 5.2 Elder Charms will be usable as a new currency for Mogushan Vaults, Terrace of Endless Spring and the Heart of Fear. The new Mogu Charms of Fate will act as a bonus currency to rolls on boss drops… and just when we started to put our spreadsheets away. These in game legal tender, like so many introduced before it serves one and only one primary purpose, to gate gear acquisition and thus game progression. While it is perfectly understandable that Blizzard wants (and needs) to gate players from the most currently released content and gear in an effort to extend game play life, using multiple currencies to do so is a myopic – and quite bluntly – lazy mechanism in which to do so. Yes it is low effort. Yes it will create the desired barrier to progression. However it does so as a short term fix that while masking the symptoms temporarily, really offers no cure. Adding multiple currencies that are specific to a game that is already so heavy based on tiers will only serve to make that very content less accessible once the next content release is launched. This in effect builds walls of linear game play that discourage a more dynamic play style and that, in the long term, is bad for retention and bad for business. If you have not guessed this by now, let me go ahead and state for the record that I am, across the board, against anything other than a single currency system in game. This includes the currency wall that exists between PvE and PvP. However I do understand even in disagreement why those currencies (Valor vs Conquest for example) exist and Blizzard has at least attempted to soften the wall with the ability to exchange the two for a premium. However there is a chasm of difference between separating PvE and PvP versus creating multiple and often confusing levels and facets of currency with a finite lifespan within PvE depending upon the tier in which you are currently gaming. As a player you should be able to do those things in game that you find enjoyable and not be forced into a bottleneck of game play like a heard of cattle/tauren all for the sake of slowing down progression. Let me be clear, no you should not be able to get 5.2 gear by picking peace bloom in Durotar and yes the fastest way to acquire said 5.2 gear should be to do the relevant content released without the ability to horde currency (i.e. elder charms) in the pre-launch period. However creating a new never before seen set of currency – once again – specifically for new content is not the answer and is shortsighted. To bolster the single currency argument from the level of strictly rant to something more along the lines of an educated opinion, let us turn to history. Since the dawn of Azeroth there are several examples of multiple exchange currencies being used, again strictly for gating purposes with results ranging from flawed and frustrating to completely illogical and unused. As an example of the former we need to look no further than the last major implementation of tiered currencies in the Wrath of the Lich King expansion. I of course am speaking of the the lost tokens of (insert your favorite cool sounding adjective here). While you could argue that this implementation was an improvement from the many types of confusing badges used in The Burning Legion, most would agree that going from horrendous to bad is not much of an improvement. To speak to the latter how about we stroll down memory lane to the many various PvP tokens that were ZONE SPECIFIC (Zangramarsh Tower PvP anyone?) 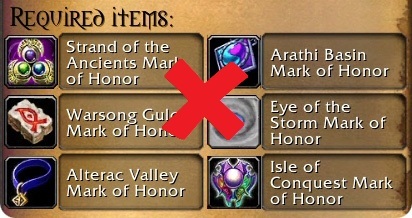 to my all time favorite; Battleground specific honor marks! That’s right kids, back in the day PvP gear and mounts required a set number of Warsong Gultch marks coupled with Arathi Basin marks and a sprinkling of Alterac Valley marks. Oh the memories have scarred me like that of an abused gamer. Indeed history tells us this is a bad idea that has never worked in game, yet down the path we stride again. In short… a cardinal rule for the introduction of any new currency into the game should be that it NEVER becomes obsolete. Yet so many have. Devalued? Perhaps, but never obsolete. This can be mitigated to some degree with an exchange similar to the Honor for Conquest and Justice for Valor mechanisms. It is not ideal, but it is tenable. Forgetting for the moment how crazy the world outside of gaming would be if we had to pay for our goods and services with 8 different currencies, of which many were not transferable, Blizzard needs to take a more proactive approach to restricting the progression flow. This could be done by introducing and implementing a new gating system that does not revolve around new and multiple currencies that will be forgotten to time and history. We have caps on valor points that already serve as a restriction, so why have the charms in the first place? If the answer is because you want people doing specific content for specific gear (which is flawed but that is another discussion for another day) then make the gear non purchasable with Valor until you unlock the areas by completing it in stages. If you step away for a moment and really think about this, using multiple currencies is actually absurd to the big picture. Multiple tiers of Marks, Tokens, Badges, Points, Charms, Shards have all been introduced to the game and many have been stricken from the Database for their failure, let us learn from that. Blizzard is an amazing company with exceptional talent and in most facets great vision. However when it comes to in game monetary and financial systems, Blizzard will not be confused with Charles Schwab or Ben Bernanke anytime soon. This entry was posted on February 13, 2013 at 11:12 pm and is filed under Economy, General, Raiding, World of Warcraft with tags alliance, Blizzard, Games, Guild, Horde, Podcast, Raiding, World of Warcraft, WoW. You can follow any responses to this entry through the RSS 2.0 feed. You can leave a response, or trackback from your own site. Great podcast, good article. I agree with everything you said save for combining PVE and PVP points. I wish PVP would just die already at least on non PVP servers.